Do you remember those bulletproof robots holding weapons in its giant claws in sci-fi movies like Avatar and Robocop? 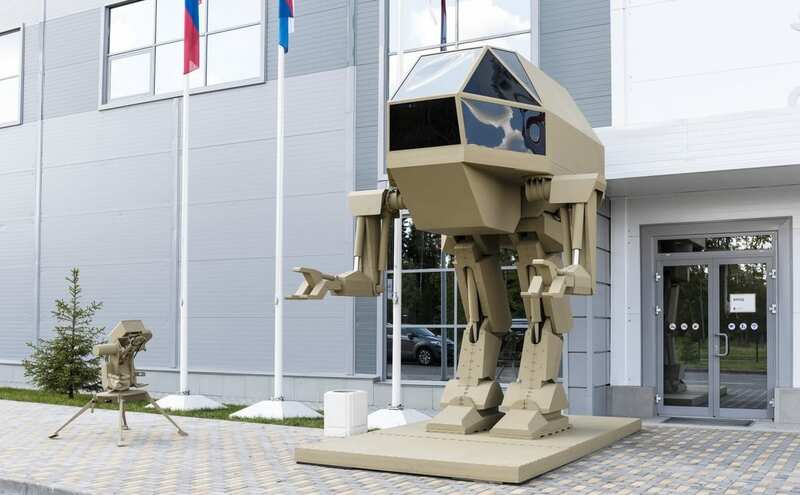 Now, Kalashnikov Concern, Russia’s most famous weapons manufacturer, unveiled a new state-of-the-art military robot at the Army-2018 international forum at the Patriot park just outside Moscow. For those unaware, Kalashnikov Concern, a Russian manufacturer known for the AK-47 assault rifle, manufactures around 95 percent of all small arms in Russia and stocks around 27 countries in the world. Dubbed as ‘Igorek’, the 13-ft tall bulletproof gold killer robot weighing 4.5 tons was revealed as a ‘demonstration of what is to come.’ The ‘controlled bipedal walker’ can reportedly hold and move objects, including weapons with its claws. There is a cabin behind robot’s glass panels, which allows people to sit and the robot can be controlled from inside. The pilots are protected from aggressors, bullets or debris, by a metal shield and armored glass. “The promising goal of using the anthropomorphic complex is to solve engineering and combat tasks,” Kalashnikov says on its website. Vladimir Dmitriev, the temporary head of the Kalashnikov Group, said: “This robot is probably one of the hottest new models of the ‘Army 2018’. Currently, it is only a demonstration of the path we are planning on following. “We understand that there are robotic machines driving on caterpillar and wheel drive, we also understand that there will be demand for anthropomorphic automatic movable systems. The robot is still under development and Kalashnikov promises to unveil more about its capabilities sometime in the future. However, a more advanced model is already in the works and it is expected to be displayed at next year’s expo.